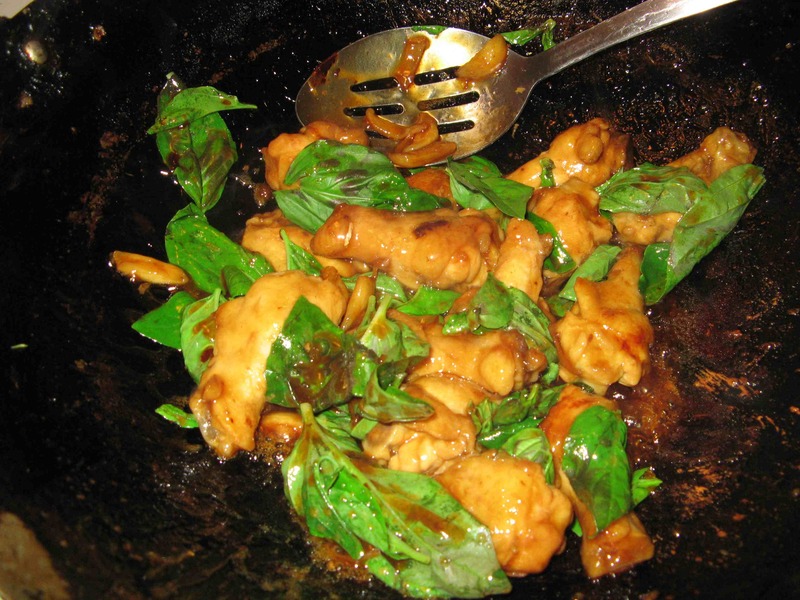 I have yet to try this classic Chinese dish in a restaurant, although I have made it before. 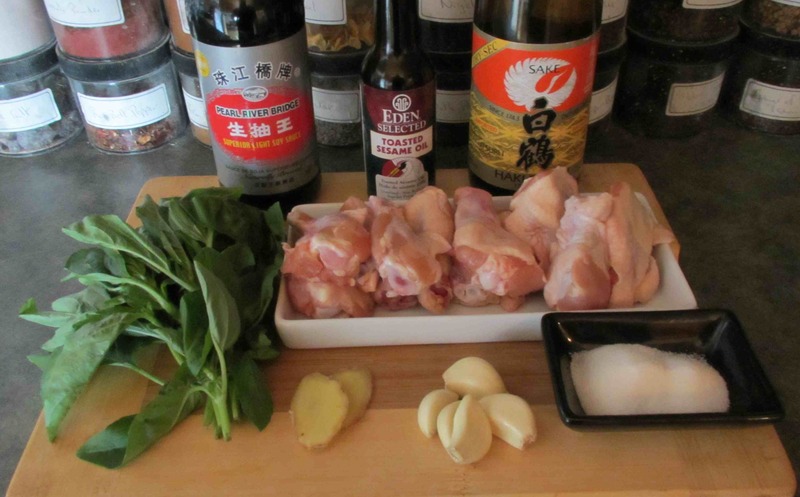 The ‘three-cups’ in the name refers to the fact that the chicken is cooked in a cup each of soy, rice wine and sesame oil, although, in actual practice, any volume of each can be used as long as they are in equal amounts. The dish apparently originated in Jiangxi Province in Southern China but is nowadays more closely associated with Taiwan where the basic recipe has been enhanced by the addition of fresh basil leaves towards the end of cooking. First, finely sliver the ginger then slice each garlic clove into four wedges lengthwise and give them a sharp bash with the flat side of your knife to crush them slightly. 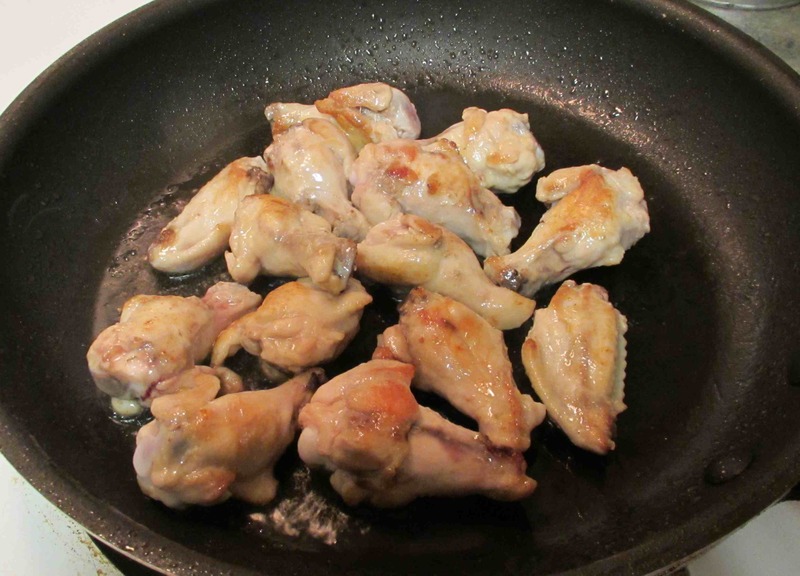 Next, heat as splash of vegetable oil in a large pan and brown the chicken wings. You don’t need to cook them all the way through. Just make sure that they are nice and golden brown on the outside. 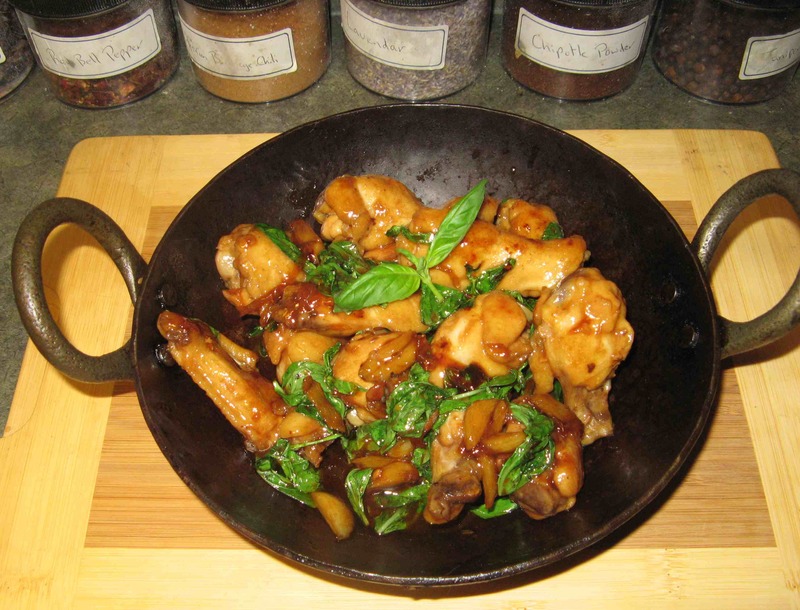 If you are using chicken parts other than the wing sections I used, make sure they are cut into small pieces. 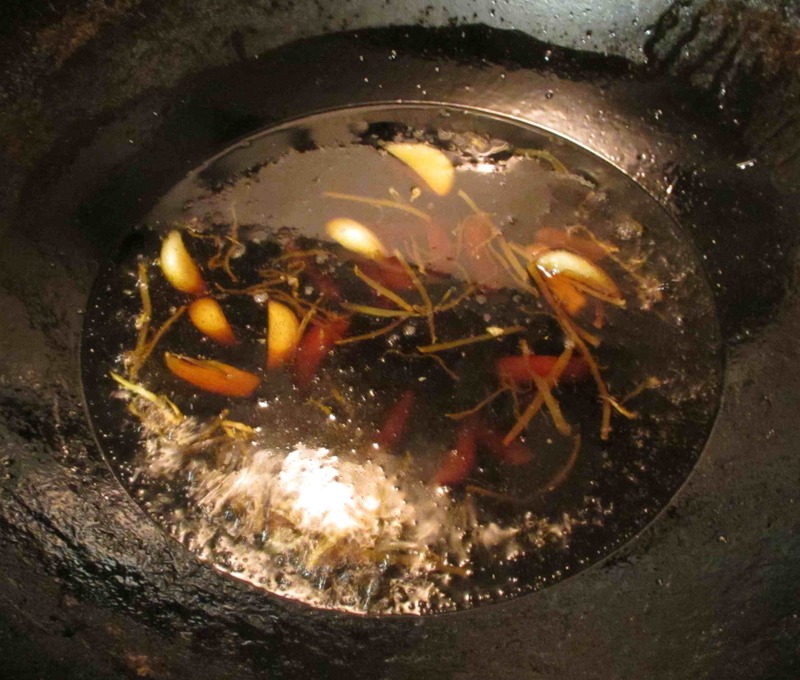 Add the sesame oil to your wok and heat it on high (but not so hot it begins to smoke). Add the ginger and garlic, stir for a moment until they release their fragrance and then add the sugar, wine and soy sauce. Let everything bubble until it is nice and frothy and then add the chicken pieces. 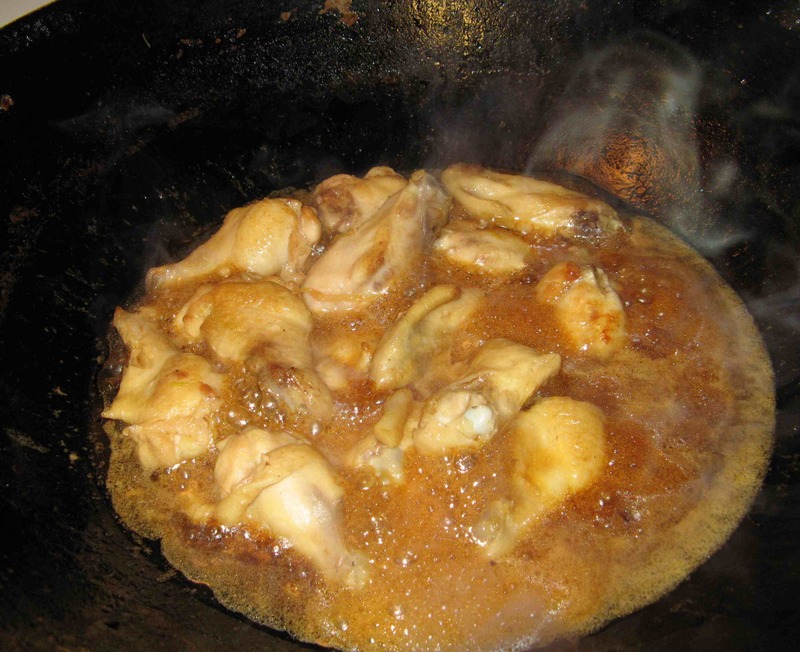 Keep cooking until the chicken pieces are cooked through and the liquid has reduced by about 80 percent or so and is thickened and glossy. If things get to the point of being a bit to dry, add an extra splash of the wine. When the sauce is just right, toss in the basil leaves and stir until they are just wilted but still a nice bright green. Plate and serve immediately. One thing that struck me was that the taste of sesame was less strong than the last time I made this dish. That was a little funny as I was using the same brand of oil this time around so I am not sure why that would be so… unless, possibly, it was because I used more basil on this occasion and that taste dominated the sesame. I also rather though that a bit of chili heat might be nice with this and, next time, I’d like to add a few dry whole peppers at the same time I fry the garlic and ginger. I ll try this, it looks great! Looks very delicious. I’m bookmarking…. This version was very nice. It is quite rich though. I would recommend serving it with some less sweet dishes and rice. Thanks for the tip … I think I have seen that brand in Ottawa. I’ll look when I visit again! The basil sounds like it really lightens up the flavor. With all that soy sauce, it would be pretty strong! Wow, this looks great! I’m always looking for more chicken recipes. Even though I jus ate, I want to make this.. I LOVE 三杯雞！！ and chicken tighs and wings are my fave part of the chicken! I cannot wait to try! !